Bacon's Map of Liverpool Corrected to the Present Time. 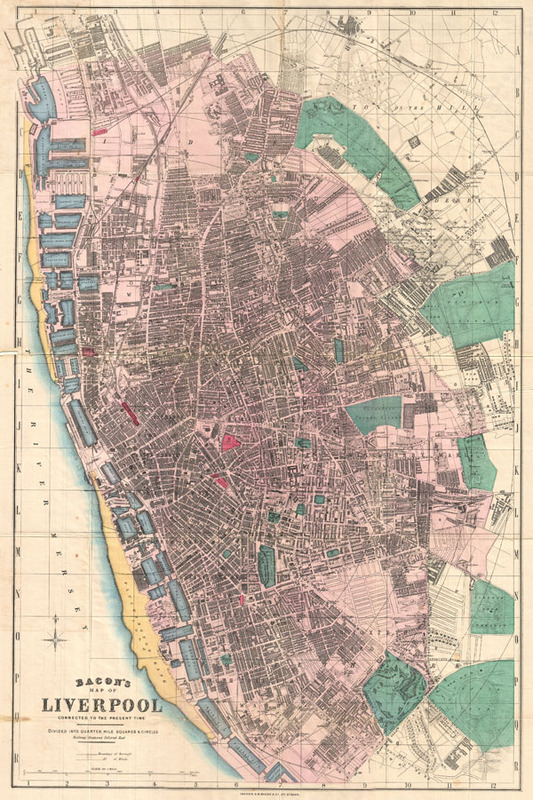 This is Bacon's scarce c. 1890 travellers pocket map of Liverpool, England. Cartographically Bacon derived this map from the Ordinance Survey with embellishments including quarter mile grid and square segmentation, beautiful hand tinting, and a focus on the identification of docks, rail stations, churches, municipal buildings, parks, and other important buildings. Notes all streets and city wards. Parks are highlighted in green, pocks in blue, sandbars in yellow, and transportation hubs in red. Published form C. W. Bacon's office at 127 Strand Street, London. This map was originally purchased in by A. H. Green in Liverpool bookseller and stationer H. B. Saunders. Very good condition. Minor verso reinforcement on some of the original fold lines. Blank on verso. Folds into original linen binder.